This is the bottom drawer of our Entertainment Center. It is the one place in the house I am allowed to keep my current reading materials. 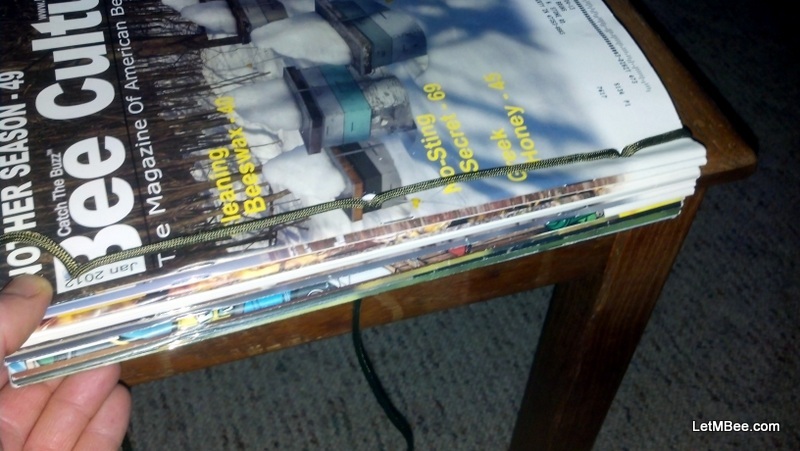 How many beekeepers out there have a pile of bee literature laying around like in this? I keep old bee magazines because believe it or not there are times I will revisit a subject in my mind and reread an old article. Not all of the magazine’s contents are on-line and I like having a hard copy around anyway. If I am going to keep them I need to have them organized better than in the bottom of a drawer. 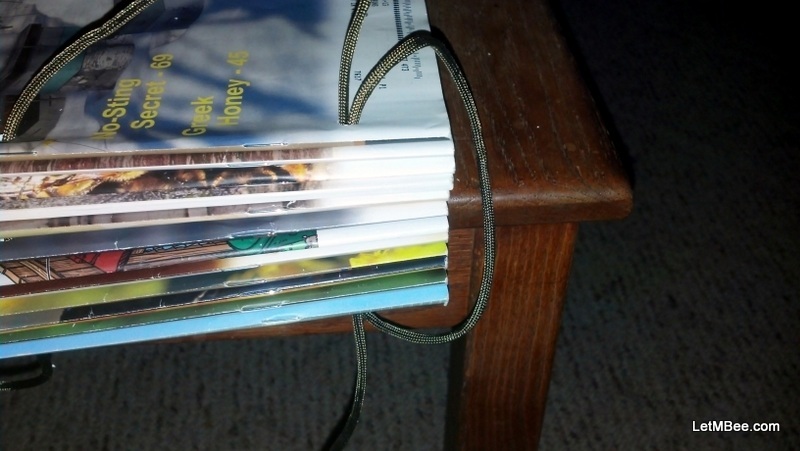 So once a year I bind them together with para-cord to make a book. 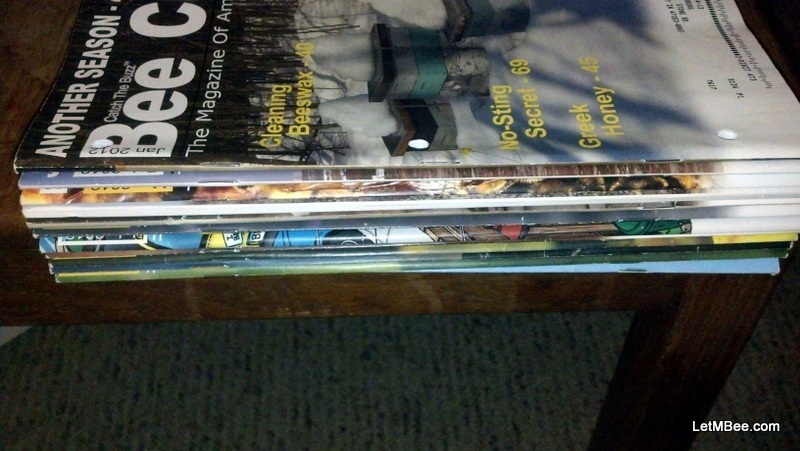 Organize the magazines in proper chronological order with January on top and December on the bottom. Place them on a table so that the 3-holes are hanging over the edge. 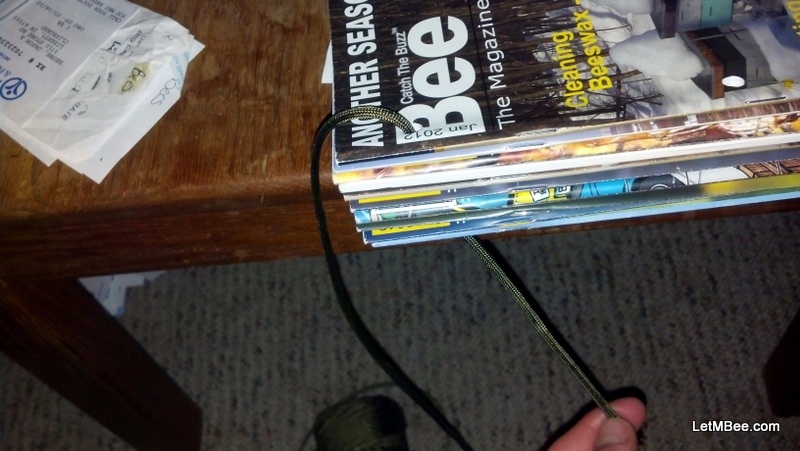 Put the spool of paracord on the floor at between your feet. 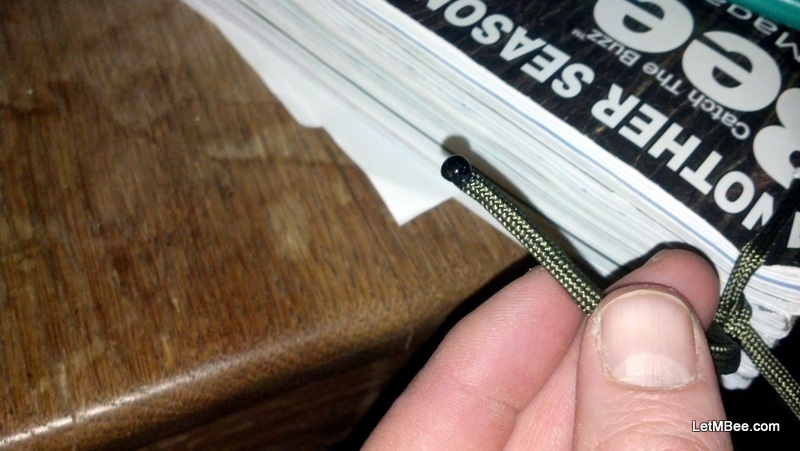 Starting at the TOP, run the paracord through the holes in a kind of figure 8 type pattern. 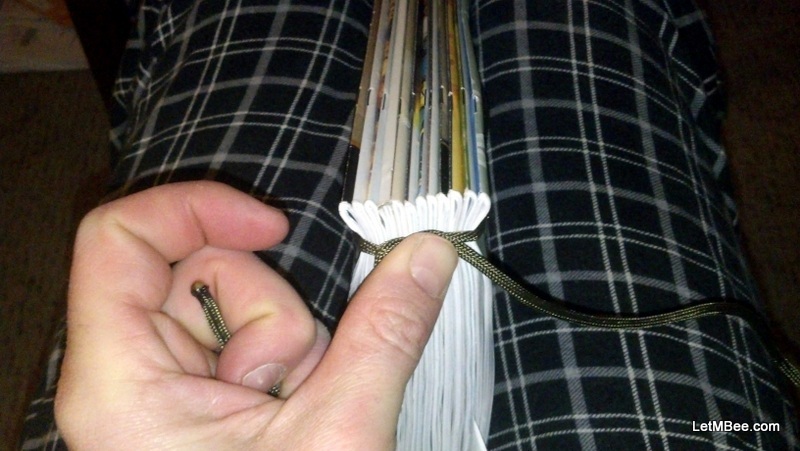 At the BOTTOM run the cord around the compiled volume and then back through the same holes making your way back to the TOP. During this step it may be necessary to separate the issues a little to get the cord through one at a time. That is why it is important to keep things loose with plenty of slack during this stage. When you get to the top you need to remove all of that slack and push the book together tightly. This is a very important step. If you aren’t careful the thing won’t feel like a book when you pick it up. BEFORE you cut your cord you need to tie this thing together. I do this by first taking as much slack out of the thing as possible by pulling really hard on the cord. 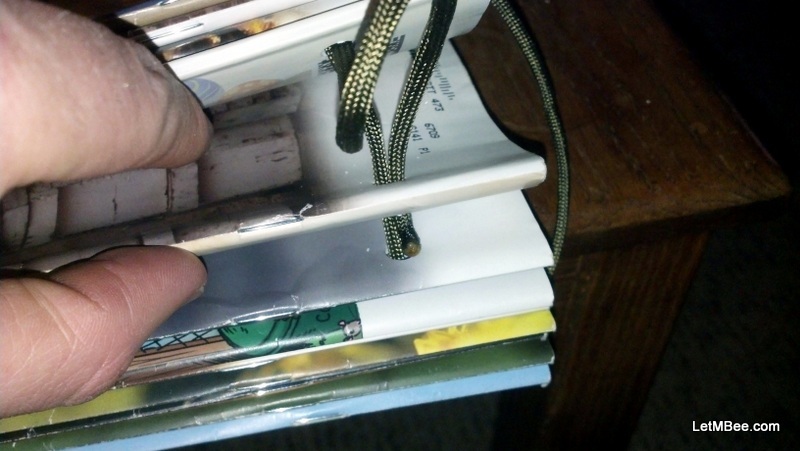 I then hold the book with my legs while holding an end in each hand. Cross it over and pull it tight like you were beginning to tie your shoes. Place your thumb on the knot as in the picture. Then form a second knot in the same fashion pulling it tightly against the first one. After the second knot is complete jerk on each free end repeatedly to pull the knot VERY tight. Cut the cord allowing enough excess on each end so that you can re-tie it in the event you need to take the volume apart. 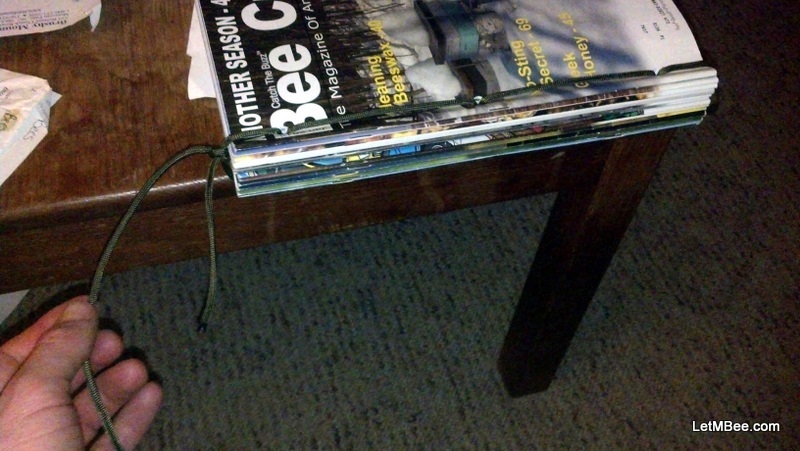 I had been missing a 2010 issue of Bee Culture until one day last summer. I just took the book apart and placed the missing issue. The volume was then rebound. It is important to melt the cut end of the paracord to keep things from unravelling. 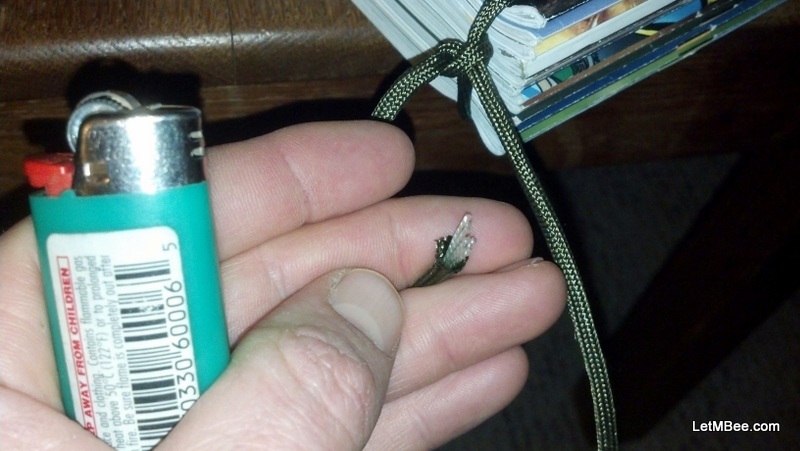 In a safe location use the lighter to melt the end of the paracord. It may light on fire. When the end begins to change from its frayed appearance to an almost liquid looking ball, BLOW IT OUT. If you allow it to burn too long the cord will melt and begin to drip in hot liquid form. So don’t do this over your carpet. Be extremely careful not to touch the melted end until it is completely cool. This can take some time so be patient. It hurts bad enough that you want to avoid getting burnt. Once completed you will be able to keep your yearly subscriptions in order. Don’t ask me what you do with them when you have 25 or 30 years worth laying around. I am not to that point yet. Check back with me then, I will be working on a plan for that eventuality. 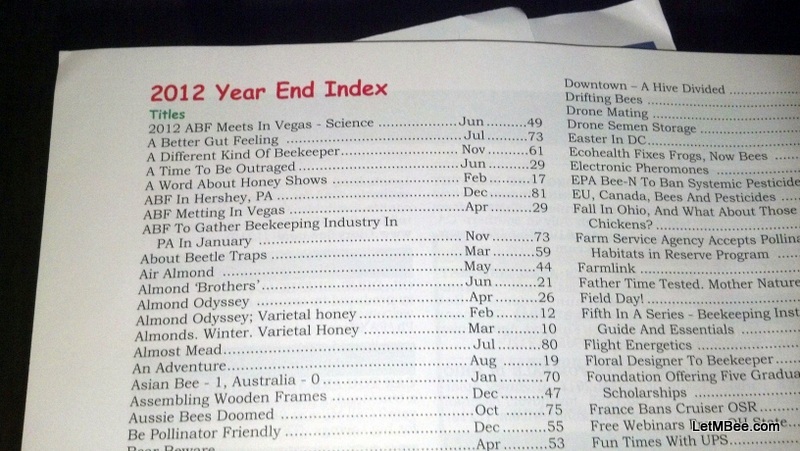 Bee Culture’s IndexSomething to remember, Bee Culture has a Year End Index that will help you when you are trying to find an articles in the future. The Index is always toward the end of the December issue. 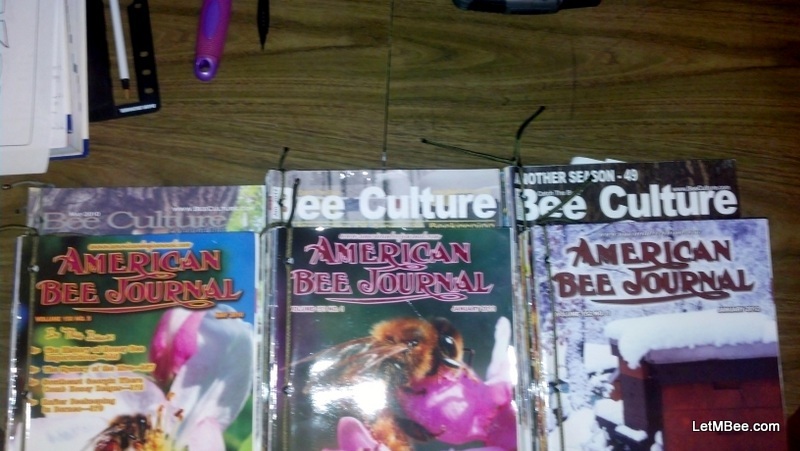 I have no idea why American Bee Journal does not do this. It is extremely helpful. All of the pictures I took for this post are in a folder on Photobucket. I will warn you they aren’t in chronological order. This entry was posted in HowTo, Posts, What's going on.. and tagged bee, beekeeping, Indiana Beekeeping, Jason Bruns, paracord, records. Bookmark the permalink. Well just remember you can use this for other purposes as well. A couple years ago Holly and I splurged on a Laser Duplex printer because I just couldn’t find some of the books I wanted to read in PAPER form. I went crazy on books.google.com. That was prior to getting into bees. I have a bunch of awesome gardening books from the early 1800’s-1930’s. Here is a link to some pictures of Langstroth on the Hive and the Honey-Bee. I highly recommend if you are interested in gardening – The History of Cultivated Vegetables Vol I & Vol II. It introduced my family to cooked radishes. The way that the Roman peasants ate em. They reportedly grew some massive radishes back then. The link to download the .PDF file is sometimes hidden, but it is usually somewhere over in the upper left quadrant. I used to read in the winter this year I have not had a chance. Here is another great site for free gardening and soil books. Thanks for link! I will be checking into that. Great post Jason! I’ve got a lot of magazines that I can put this to use on. I love doing research and reading on the internet, but I still like having hard copies of books and magazines and this will help me stay more organized with them.